Today is my sober anniversary! 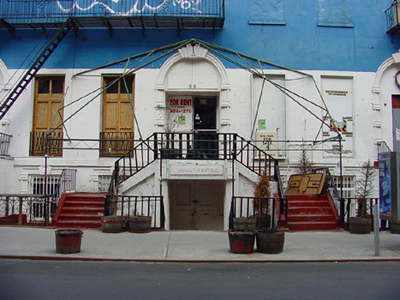 Twenty years ago today I appeared on the steps of the building pictured above, 19-25 Saint Mark’s Place in New York City’s East Village. That morning I had traveled from my home in Pennsylvania to attend a rehab in the Bronx, but then I had been denied admittance to the rehab and had nowhere else to go. I was literally penniless. I was also hungry. It was about 5pm and I hadn’t eaten anything that day. Dealing with the Bronx rehab’s admissions person, a Puerto Rican man named Americo, had been an epic fiasco, all of my own making. When he gave me the subway token and directions to the East Village, I felt terrified. Really scared. But by the time I got off the train, I had already acclimated to my new situation. I asked the other homeless people at the shelter if there were any food. People looked to their left and right. Someone coughed into his hand, another person brushed lint from her shoulder. Food was tight. Finally a large black woman took pity on me and ladled a heap of plain macaroni noodles onto a paper plate. She waited for me to respond to her kindness. I looked at the plate in front of me. “What, no tomato sauce?” I asked. The black woman chuckled. “Aren’t you something,” she said. She was absolutely right. I certainly was something. And twenty years later, I hope I’m something else. You HOPE your something else? … You ARE something else! Your triumphs are still alive in Steelton. Being the Po Po in Steelton I meet a lot of your old clique. I often share how well you are doing … I’m very proud of you. Hey Tim. Great story. I always love to hear those getting clean tales. They really are right down there in the dirt, aren’t they? I’d like to know that black woman. Aren’t you something, indeed. You have to be, to be able to tell that story. Congratulations. Twenty Years! Ain’t life grand! Talisker, looking back is a very interesting question. If it weren’t for my oldest son, I might very easily look back and pretend none of it ever happened. After all, I’m 3000 miles from the scene of crime and it’s been 20 years. I rarely meet anyone who knew me back in the day. My guess is that’s how people relapse–a little bit of delusion goes a long way. Troy, You are very kind. That means a heck of a lot to me. I apprecaite it very much. One day I have to get you to do some guest blogging here on the site. I will handle all the stories of drunken debauchery and running from the cops and you can tell the all the tales of drunken debauchery and chasing the criminals! armand and sarah, thanks for the props. It feels good to get all the love.